View More In CD-R Discs. ♥ This Product Has 12 Months Replacement Warranty. We focus on providing quality power products and excellent customer service. 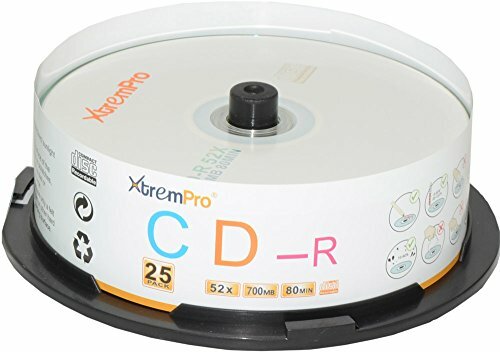 XtremPro recordable (R) optical discs with high compatibility with drives and the wide range of formats and capacities. Do not store the products in the direct sunlight or in hot or humid areas. Avoid touching the recording surface of the product to prevent fingerprints or scratches. Keep the recordable surface clean, as dust or condensation may affect its performance. When writing a label on the disc, use only a felt tip pen. Do not use a ball-point pen or other hard tip devices as it may damage recording surface. This Product Has 12 Months Replacement Warranty. We focus on providing quality power products and excellent customer service. If you have any questions about this product by XtremPro, contact us by completing and submitting the form below. If you are looking for a specif part number, please include it with your message.